Washington, DC (BlackNews.com) - ACORN (The Association of Community Organizations for Reform Now), together with its partner Project Vote, has collected 1.3 million voter registration applications across 21 states for the upcoming election. ACORN has now turned its sights to fighting voter suppression and getting out the vote on November 4. The massive drive employed 13,000 workers and ACORN anticipates that nearly one million citizens will be able to vote on Election Day as a result. Many of the voter registration applications the groups collected were from low-income Blacks and Latinos and others who are traditionally disenfranchised. ACORN executives pointed to several incidents of Republican voter suppression and dirty tricks. 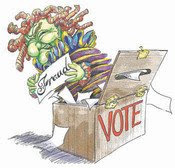 • In New Mexico, the Republican Party claimed that fraudulent voters participated in the June 2008 Democratic primary, however ACORN contacted several of these "fraudulent voters" and found they were legally registered. On Monday GOP operatives were sued by the ACLU of New Mexico and the Mexican American Legal Defense and Education Fund for invasion of the voters' privacy and intentional infliction of emotional distress, including sending a private investigator to one of the voter's homes. • In Los Angeles, the Republican Party hired a firm that deliberately tried to get people to register as Republicans by telling them they were signing a petition for tougher penalties against child molesters. • Other incidents have included reports of possible use of foreclosure lists to challenge voters at the polls in Indiana, Michigan, Ohio and Florida and attempts to stop Ohio from registering voters at early voting sites. "The real issue here is a coordinated attempt to discourage people from voting," said ACORN Chief Organizer Bertha Lewis. "We must be vigilant in ensuring that every single American who should be voting gets to vote and that no one stands in their way." New voters ACORN has registered include Lynncoyia Bradley of Cincinnati. "I want to be able to tell my daughter that I voted in the election in the year she was born," said the mother of a 9-month-old. Bradley's concerns include the economy and health care; her mother lost her home to foreclosure in 2006 and had a stroke last year. This November, Maria Peinado, 52, a single mother and native of Mexico will vote for the first time. She became a citizen on May 2 and registered to vote the same day. "I have lived in this country for over twenty years -- it's time to have my voice heard," Peinado said. Lewis urged all eligible voters to vote early or go to the polls on Election Day. She and thousands of members of her organization plan to spend Tuesday, November 4 walking these new voters to the polls. Those who encounter problems voting or have general election questions should call 1-866-Our-Vote or email help@866ourvote.org.